I have a bionic daughter! Dotter version 2.0! 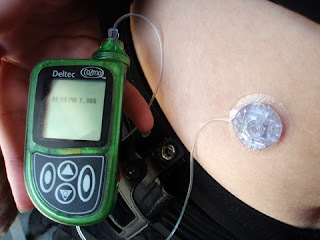 Here is her tummy, and the line, and her brand new green Cozmo insulin pump. This little beauty is worth more than anything else we own (yes, even more than our cars). Thank goodness for the wonderful parents who did the fund raising so she can have this. The connection into her tummy is just a soft cannula tube, it goes in for about 9 mm. The clear plastic 'button' and sticking plaster sitting on top of the insertion is to hold the tube securely in place, and cover it to keep it clean, and it also allows her to disconnect the pump when she's having a shower. There isn't a permanent port, nothing surgically implanted. The site gets changed every 3 days (something she's just learnt to do herself), it's basically like doing an injection, only what gets injected is a needle and the soft plastic cannula, and the needle comes back out, leaving the soft tube in her tummy. Of course, as it's stuck in her tummy for 3 days at a time, hygiene is much more important, we have sterile swabs, and have been taught how to wash and dry our hands like a surgeon does. Now all she needs to do is lots of finger prick blood tests, she'll always need to do those (until under-the-skin BGL monitoring works better, anyway), and then she enters her blood glucose reading, and how much carbohydrate she's about to eat (to the nearest 5g), and the pump does the rest, delivering the insulin she needs - so no more injections for every time she has to eat! We have a few nights of 3 hourly blood tests (midnight, 3am, 6am) ahead of us, and two more days of hospital visits, but we're going well so far, if a bit overwhelmed with information ... it's good though. Very good. Well if you've got to be overwhelmed, it's nice to be overwhelmed by something GOOD for a change, isn't it? So glad to hear things are going smoothly and I hope this is a huge change for the better for her. Oh it is shiny and green!!! I learned to insert one of those needly things too. I needed one everyday. I had to make up stuff and put it into a syringe and then attach it to a much sadder pump. I liked playing hospital at home. It is a feeling of independence. Good news, glad everything went well, and hope it settles into a happy routine soon!!! Here's wishing all goes well for her! Thank God for Modern Medicine! Hooray for Dotter and her pretty tummy. Blessings on the weary Jejune who no doubt is rising and helping with those many, many blood tests. May you all have a sleepy, peaceful, boring month soon! Cool green color on the pump! : ) Glad to hear it's going well...hang in there, sweeties! it looks like an mp3 player :) Best of luck and hoping life becomes a bit smoother now you have your gadget. That's kinda freaky and cool all at the same time! I have a coworker who got one of those and said it made all the difference in the world. I'm glad someone was able to raise the money for dotter but I agree, it should be paid for by insurance or part of her general health care. Hah! I could hear that weird 6million dollar man type music when I read v2.0. If that pump doesn't get a cool knitted cover/sock within a week of it's new life, I'm a yarn eating squirrel. With all that hardware, I suppose that there is no need for a belly button ring now.